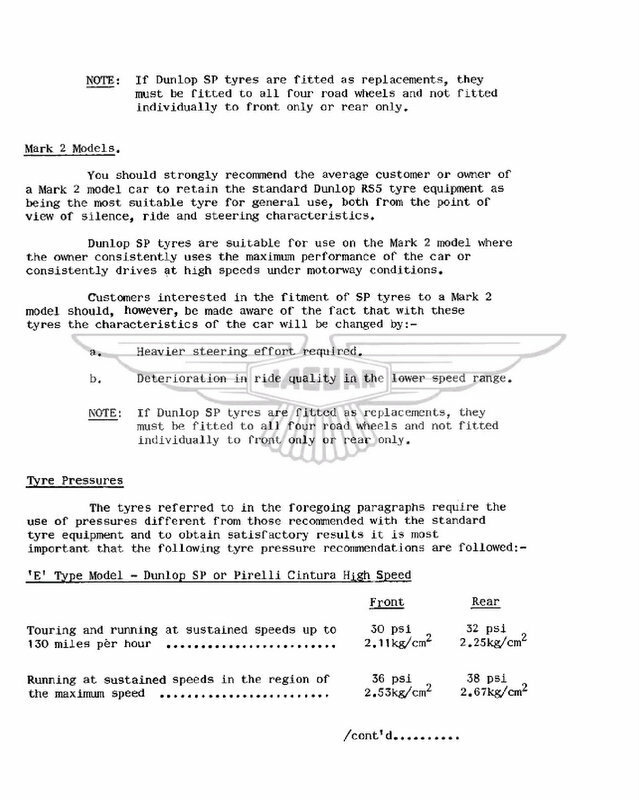 Original equipment tyres for a series 1 e-type was Crossply 640H15 Dunlop RS5. Currently the only period suitable tyre is the 185VR15 Pirelli Cinturato. We would also suggest this is the best tyre for an early XKE. 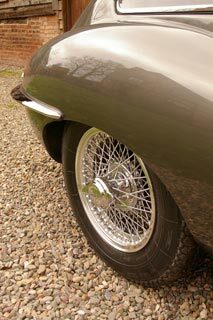 Series 2 E-type Jaguars came fitted with 185VR15 Dunlop Aquajet. 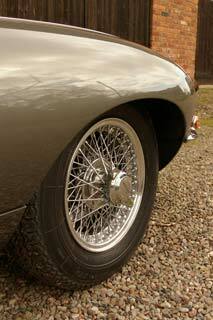 We suggest that the best tyres for a MK2 XKE is the 185VR15 Cinturato or 185VR15 Michelin XVS. Series 3 V12 E type Jaguars fitted Dunlop ER/70VR15 Aquajet. Currently we suggest that the best tyres in this size are 205/70VR15 Michelin XWX or 205/70VR15 Pirelli Cinturato CN12. For information about the ideal tyre pressure for your XKE follow this link. There is more explanatory information about our recommendations for Jaguar XKE tires. As I write this we have just had a customer in with a lovely MK2 e-type who was having a replacement set of the 185VR15 Pirelli Cinturato CA67 tyres fitted. He was replacing like for like, because they had been on the car for 9 years, he has loved driving on them, They had returned 14,000 miles and were only 2/3 warn. 'Initially the Series 1 e-type fitted crossply tyres. However Jaguar offered 2 radial alternatives at the factory: 185-15 Dunlop SP 41 which is no longer made, or the 185VR15 PIRELLI CINTURATO ™ which is now being manufactured again. We have calculated an all in special deal for E-Type Jaguar owners requiring a Set of 5 185VR15 PIRELLI CINTURATO ™ CA67 tyre. This deal includes reduced price on the tyres and free carriage to most of the world, and subsidised shipping charges to the rest of the world. PIRELLI also manufacture a 205/70VR15 CN12 CINTURATO ™ HS, for series 3 e type's and people who like a wider tyre to fill the wheel arches in the earlier cars (you must however adjust your rear bump stops on the earlier XKE if you want to fit these wider tyres). The other top option for a V12 E-type would be the 205/70VR15 Michelin XWX Because it's robust carcass offers excellent direction stability at high speeds and progressive handling need on these powerful cars. It is important to note that when Jaguar fitted the V12 engine to their 3rd series XKE they also added power steering. This was to overcome the differences to the handling that fitting 205/70VR15 tyres caused. In 1968 they also fitted these wider tyres to the XJ6, but Jaguar didn't fit them to series 2 - X K E that was in production at the time, because a 6 cylinder XK E handles better on a 185VR15. 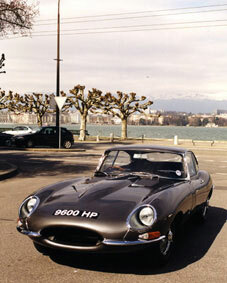 The first E-Type Jaguar was fitted with a 640H15 Dunlop RS5 cross ply tyre. 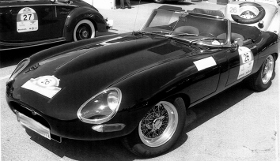 Soon the series one e-type offered the 185VR15 PIRELLI CINTURATO ™ as a radial ply alternative. This PIRELLI CINTURATO ™ would be the sporting choice of tyre today for series 1 an 2 e-type Jaguars as it is one of the best tyres in the size and it was original equipment. In period the CINTURATO ™ was a very expensive tyre so when Dunlop developed their SP41 that was also offered as a radial alternative; now no longer manufactured. In 1968 Jaguar moved on to the series 2 E type; at which point Jaguar moved on to fitting radial tyres as standard, predominantly fitting the 185VR15 Dunlop SP Sport or Aquajet as it was also called. Dunlop had a long standing relationship with Jaguar and of course with them being local to each other the price of the Dunlop made it very attractive compared to the Pirelli and Michelin that were available at the time. All things considered Longstone Classic tyres feel the best tyres to fit to pre 1971 non power steering E types (series 1, series 1_, and the series 2) are the 185VR15 PIRELLI CINTURATO ™ or the 185VR15 Michelin XVS which is an asymmetric tyre developed in the 60's to make cars of this period more suited to motorways. 1971 saw the introduction of the series three Jaguar XKE in 5.3 litre V12 form fitted, as standard, with Dunlop ER70x15 (205/70HR15) radial tyres on 6"x15" steel wheels (wire wheels were optional). 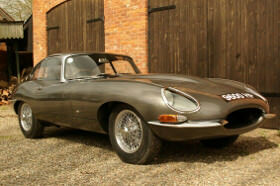 The series three Jaguar E-Type also had the benefit of power steering as standard equipment. This overcame the problem of otherwise heavy steering gained by the fitment of wider tyres. The tyre size ER/70VR15 is now called 205/70VR15. There are a reasonably wide range of tyres in the size 205/70VR15, of which we would suggest that the 205/70VR15 Michelin XWX and PIRELLI 205/70VR15 CN12 CINTURATO ™ HS are the best tyres available. They are genuine period tyres that were fitted by Ferrari, Maserati and other European exotic cars. The XWX was also the tyre that the British Police chose to fit to their XJ6 cars, however for the general public they were considered often too expensive. The price of the XWX and CINTURATO ™ are now more comparable with other tyres in that size, and worth every penny. 205/70VR15 Michelin XWX are great tyres for E-Type Jaguars. If you have a series 1 or 2 XKE the period Michelin XWX or PIRELLI CINTURATO ™ would be a great tyre if you want to fill your wheel arches more, without dramatically making the steering of your XKE dramatically heavier. A more modern 205/70VR15 tire will have a greater foot print in relation to the width of the tire which paired up with the non power steering of an earlier XKE can tend to make it more vague and heavy. Michelin XWX and PIRELLI CINTURATO ™ tires are also excellent to fit to the series 3 V12 Jaguar XKE. In 1961, 12 years and 4 months after the launch of the XK120, Jaguar wowed the world again at the Geneva motor show with the Jaguar E type (XKE) coupe. This phenomenal car offered people 265bhp, 150mph performance with acceleration to match and 18mpg average fuel consumption, all from a fully equipped touring/sports car that cost ?2000. In its day this was a feat that no other manufacturer had achieved and is quite remarkable even now! From its inception in '61 in 3.8 litre series one E Type form, through 4.2 litre series two Jaguar E-Type in 1968 to its death in '75 as the 5.3 V12 series three XKE the Jaguar E-type was a benchmark car, and some might say, the most beautiful car of all time. First we have the movie of The Tortoise and Hare - ⒸPIRELLI, then the next 3 films deal with the 3 different models of e-type Jaguar and hopefully demonstrate our reasoning behind our recommendations as to which are the best tyre for these 60's icons. 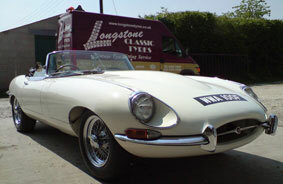 After the films, are listings of all the best tyre options offered by Longstone tyres for your XKE. If you would like to have the ultimate wire wheel upgrade then please click here for information on Borrani wheels for the E Type Jaguar.